In my area (central Illinois), Megacollybia rodmani is one of the first mushrooms to appear after the seemingly eternal lull in fungal activity following morel season, popping up eagerly after May and June rains. 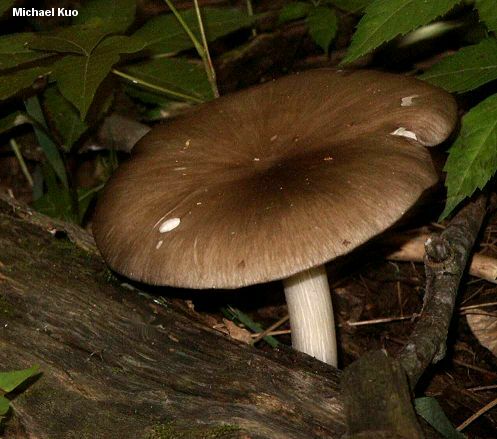 It is a medium-sized mushroom with a streaked-looking, gray-brown to brown or olive brown cap and a white spore print, formerly known as "Tricholomopsis platyphylla" and assumed to be the same species across North America. However, recent research (Hughes and collaborators, 2007) has changed the picture substantially so that Megacollybia rodmani is defined by its DNA and must be identified either by molecular sequencing, or by considering its range and ecology (east of the Rocky Mountains, decomposing the deadwood of hardwoods) and then eliminating two contenders with as-yet limited ranges; see the key to Megacollybia for details. Two fairly easily distinguished "forms" of Megacollybia rodmani have been described: form rodmani and form murina. 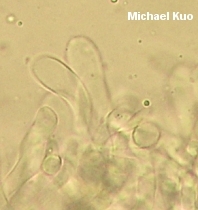 The former is taller and more slender, has inconspicuous (or even absent) rhizomorphs at its stem base, features brown to olive brown shades on its cap, and has cheilocystidia that scarcely project; the latter is stout and gray-brown, with conspicuous rhizomorphs, and projecting cheilocystidia. Both forms are illustrated to the right. 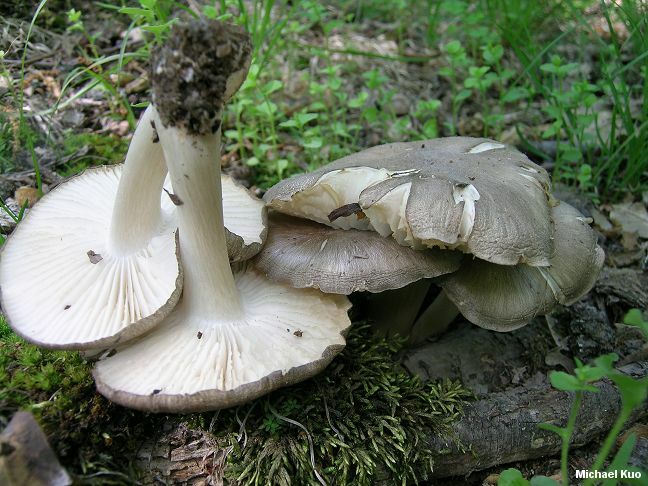 "Tricholomopsis platyphylla" and "Megacollybia platyphylla," in the sense of North American authors, are, in part, synonyms--especially when these names are used to refer to eastern North American material. 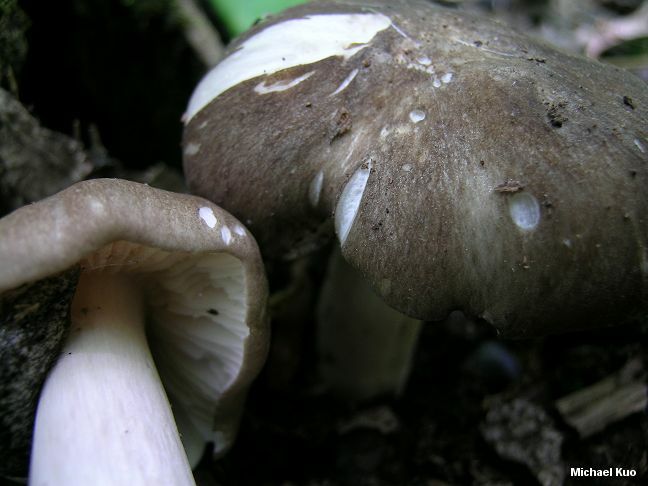 However, Megacollybia platyphylla in Europe is an autonomous species. Ecology: Saprobic; growing alone or gregariously on rotting hardwood logs or from buried deadwood; May through July; fairly widely distributed and common east of the Rocky Mountains, south through Mexico to Central America. Cap: 3-20 cm; convex when young, becoming broadly convex to flat or shallowly depressed in age; dry; brown to olive brown or pale grayish brown in form rodmani; gray-brown to gray in form murina; radially streaked. Gills: Attached to the stem broadly or narrowly; close or nearly distant; whitish. 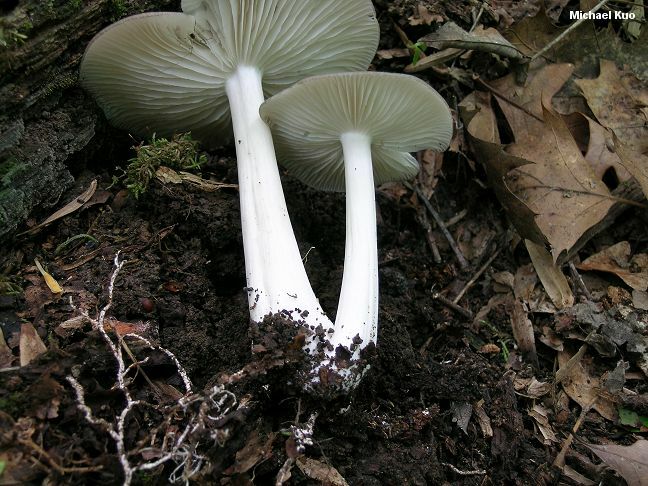 Stem: 5-12 cm long and up to 1 cm wide in form rodmani; 5-9 cm long and up to 2.5 cm wide in form murina; finely silky; whitish; more or less equal above a slightly enlarged base--or tapering slightly to apex; base attached to copious and conspicuous rhizomorphs in form murina, or with inconspicuous or even absent rhizomorphs in form rodmani . Flesh: Whitish, not changing when sliced. Microscopic Features: Spores 6-10 x 5-7.5 µ; smooth; ellipsoid; inamyloid. Cheilocystidia abundant; primarily clavate; to about 60 µ long and not projecting in form rodmani; to about 80 µ long and usually projecting in form murina. Pileipellis a cutis of elements 4-9 µ wide, with brownish contents; terminal elements frequently erect, with clavate to subclavate or merely cylindric tips, 23-74 x 6-16 µ. Clamp connections present. REFERENCES: Petersen, Hughes & Lickey, 2007. (For "Megacollybia/Tricholomopsis platyphylla": Kauffman, 1918; Smith, 1949; Smith, 1960; Arora, 1986; States, 1990; Phillips, 1991/2005; Lincoff, 1992; Horn, Kay & Abel, 1993; Barron, 1999; Roody, 2003; McNeil, 2006; Miller & Miller, 2006. For Megacollybia rodmani: Hughes et al., 2007.) Herb. Kuo 06039501 (f. rodmani), 06140202 (f. rodmani), 05120706 (f. murina), 05281004 (f. murina). 06311004 (f. murina).